The saying in football is that on any given Sunday any team can win. The champions of our sport will have no easy time at the IKF Nationals as the best of the best come to meet the challenge. Fighters rise to the task when faced with great talent and our returning champions surely provide that. Don't hand out the belts quite yet as new talent will certainly emerge and increase the field of fighters to watch. As Jesse Finney puts it "Stay positive". I am positive there will be great fights for all the belts and we will enjoy the best tournament in America. Looking forward to seeing all of you. They Started the Event With The Song "We Will Rock You!" And They DID! On Saturday morning, the IKF/TKO USA National Amateur Championship Tournament opened with the lights down low and 10 seconds of silence for the recent loss of MuayThai star Alex Gong. From the darkness, the lights focused on the American Flag as Mary Lee Malmberg (Director of Sports Tourism) of the Cedar Rapids CVB broke the silence with the National Anthem. The moment she was done, the sound system in the massive U. S. Cellular Center blasted out the song "We Will Rock YOU!" setting the stage for the greatest Amateur Kickboxers in America to do just that, ROCK US! And they DID! As the music played, each fighter took their last breath of air as a spectator and all became champions who all met on this weekend to "Walk The Walk" in the U. S. Cellular Center in Cedar Rapids Iowa at the Greatest IKF Amateur Tournament to date and very possibly, the Greatest Amateur Kickboxing Tournament EVER! This was REAL Championship Kickboxing! This was an Outstanding EVENT that will forever set the stage for any promotion of this type to come! This was a great event not because of the effort of one promoter. Not because of the talents of one fighter. This was great because of the efforts of "EVERYONE" associated with the IKF on this given weekend who put in time to make it all possible. From those who ran gloves or cleaned floors to the stars of the show, the Champions, everyone represented a chain that held us strong throughout the entire 63 hours of the event (12 noon Friday to 5 PM Sunday). Doing their jobs, each proved in their own way to be the Team's strongest link and through the efforts of the many we all shinned in the success of it. With the lights of the massive U. S. Cellular Center turned down, only two squares were visible to those in attendance. The two squares under the ring lights in the middle of the arena where the best amateur kickboxers in America would take the stage to "Walk The Walk!" All who entered the ring this weekend will forever be known, as those who in the past, as the "Best Amateur Kickboxers In America!" In attendance were past multiple time Champions such as Stephen Thompson of Simpsonville, South Carolina and Peyton Russell of Minneapolis, Minnesota who have "Walked the Walk" before but this year, came to put in time as part of the event staff to help others take center stage under the lights. They were just two of an event staff that worked around 150 bouts in two days and turned in a performance by event officials that was simply SUPREME! There are so many stories to be told as always and some we noticed have been told on the IKF Message Board with more to follow. The news page will be quiet for a week though since the IKF Staff will be taking a much needed week off now to get recharged for more IKF Action. Some of that action will include the IKF North American Championship Tournaments and other great upcoming IKF Events. Not to mention the work with our IKF TV Show that will start on September 5th. 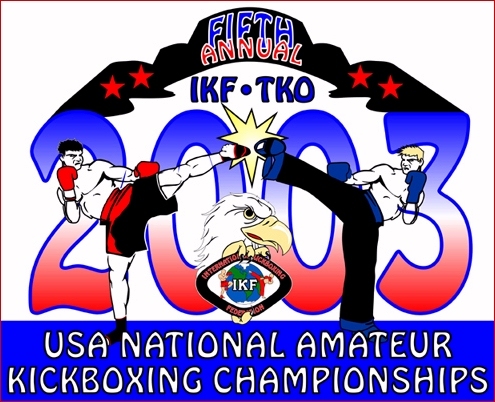 So for now, we know you all want to know who was crowned the 2003 IKF/TKO USA National Amateur Champions... So lets "Bring It On" and share with you how each and every fighter this weekend, ROCKED US ALL! INTERNATIONAL RULES: Junior Featherweight 60.1-65 lbs. 10-12 Year Olds. Lynsey Reimer, Dubuque, Iowa, USA, 1-1/0, 64, 4'3", 10, 7-3-93, Dean Lessei by TKO (Corner threw in towel) at :20 seconds of round 2.
INTERNATIONAL RULES: Junior Lightweight 65.1-70 lbs. 8-9 Year Olds. Allie Oudthone, Jacksonville, Arkansas, USA, 1-1/0, 66, 4'4", 10, 2-8-93, Prathet - Muay Thai by TKO (Corner threw in towel) at 1 minute of round 1. FULL CONTACT RULES: Junior Cruiserweight 90.1-95 lbs. 11 & 12 Year Olds. Bianca Solis, Nampa, Idaho, USA, 4-1-1/0, 91, 4'6", 12, 11-26-90, Chris Reyna, by unanimous decision 30-27 on all 3 judges cards. Becky Spelz, Chicago, Illinois, USA, 1-1/0, 94, 5'4", 11, 9-19-91, Kim Klauba lost to eventual champion DeFazio in round 1 by unanimous decision 30-27 on all 3 judges cards. Laryssa Zarate, Elgin, Illinois, USA, 0-2/1, 91, 5'2", 12, 10-27-90, Rob Zbilski lost to Solis in round 1 by split decision 30-27, 29-28 and 28-29. FULL CONTACT RULES: Light Atomweight 100.1-105 lbs. 13 Year Olds. Jackie Artaga, Plainview, Texas, USA, 1-2/0, 105, 5'1", 13, 10-25-89, Tommy Alcozar by unanimous decision 30-27 on all 3 judges cards. INTERNATIONAL RULES: Atomweight 105.1-110 lbs. 17 Year Olds. Amber Baillie, Peoria, Illinois, USA, 0-1/0, 110, 5', 17, 2-13-86, Ryan Blackorby by split decision, 29-28, 29-28 and 27-30.
INTERNATIONAL RULES: Flyweight 115.1-120 lbs. 13-14-15 Year Olds. Lauren Herrig, Dubuque, Iowa, USA, 2-2,0, 115, 5'4", 13, 4-5-90, Dean Lessei, by unanumous decision, 30-23, 29-26, 29-24. Kayla Oudthone, Jacksonville, Arkansas, USA, 2-10/0, 120, 5'9", 14, 8-3-89, Prathet Muay Thai lost to Williams in the opening round by TKO at 1:24 of round 1. Jackie Prine, Omaha, Nebraska, USA, 0-1/0, 120, 5'4", 15, 5-20-88, Mick Doyle lost her opening round bout to Herring by split decision 29-28, 29-28 and 27-30. FULL CONTACT RULES: Flyweight 115.1-120 lbs. 12 & 13 Year Olds. Laura Jo Wessels, Beloit, Wisconsin, USA, 2-2/0, 120, 5'1", 15, 3-27-88, Peter Hetrick, by unanimous decision, 30-27 on all 3 judges cards. Yvette Renteria, Plainview, Texas, USA, 16-4/3, 115, 5'2", 15, 5-21-88, Tommy Alcozar lost her opening round bout to Wessels by split decision 29-28, 29-28, 27-30. FULL CONTACT RULES: Featherweight 125.1-130 lbs. 16-17 Year Olds. Rachelle Heslop, Douglasville, Georgia, USA, 2-1/0, 130, 5'8", 16, 12-12-86, Mike Wood by unanimous decision 30-27 on all 3 judges cards. Jaquee Hennefer, Carlton, Texas, USA, 2-2/0, 128, 5'4", 17, 6-20-86, Jeff Laun, lost her round 2 bout to Hess by unanimous decision 30-27 on all 3 judges cards. Diana Aspresa, Camp Verde, Arizona, 6-2/0, 126, 16, Richard Williams, lost her opening round bout to evenyual champion Hess by unanimous decision 30-27 on all 3 judges cards. Jerica Veach, Dubuque, Iowa, USA, 1-2/0, 130, *13, 12-11-89, Dean Lessei lost her opening round bout to Heslop by unanimous decision, 30-25, 30-25, 29-26. (*) OKed by trainer to fight in this division with the older fighters. INTERNATIONAL RULES: Junior Flyweight 50.1-55 lbs. 8-9 Year Olds. Michael Blake, Dubuque, Iowa, USA, 1-2/0, 51, 4'3", 8, 12-15-94, Dean Lessei, by unanimous decision 30-26 on all 3 judges cards. Mason Wilke, Pacific, Missouri, USA, 1-1/0, 51, 4'1", 8, 10-23-94, Benny Voyles, had a first round bye but lost his first bout to eventual Champion Perez by split decision, 29-28, 30-27, 27-30. Cody Lamison, Butler, Pennsylvania, USA, 0-1/0, 54, 4'3", 9, 4-26-94, Jimmy Stewart, lost his first bout to eventual Champion Perez by unanimous decision, 30-25, 30-25, 30-27. Colton Lamison, Butler, Pennsylvania, USA, 0-1/0, 55, 4'2", 8, 4-26-95, Jimmy Stewart, lost his first bout to Blake by split decision, 28-27, 28-27, 27-28. FULL CONTACT RULES: Junior Lightweight 65.1-70 lbs. 10 - 11 - 12 Year Olds. Ben Russell, Falls Church, Virginia, USA, 4-1/0, 66, 4'4", 10, 5-27-93, Mike Hess by unanimous decision 30-27, 29-28, 29-28. Cameron Monyelle, Beloit, Wisconsin, USA, 1-1/0, 67, 4'6", 12, 7-7-91, Craig Monyelle lost his opening round bout to Russell by TKO at 1:02 of round 2. FULL CONTACT RULES: Junior Welterweight 70.1-75 lbs. 9 - 10 Year Olds. Devin Smith, Beloit, Wisconsin, USA, 1-1/0, 74, 4'11", 10, 9-3-92, Craig Monyelle by split decision 29-28, 29-28, 28-29. Jacob Ball, Pennsville, New Jersey, USA, 0-3/0, 73, 4'7", 10, 5-26-93, Tim Ball, lost his opening round bout to Solis by split decision 30-27, 29-28, 28-29. FULL CONTACT RULES: Junior Welterweight 70.1-75 lbs. 11 Year Olds. Raul Mortinez, Plainview, Texas, USA, 8-4/3, 75, 5'1", 11, 9-4-91, Tommy Alcozar, by unanimous decision, 29-28, 29-28, 30-27. FULL CONTACT RULES: Junior Light Heavyweight 80.1-85 lbs. 12-13 Year Olds. Edson Renteria, Plainview, Texas, USA, 11-3/5, 81, 4'10", 12, 1-7-91, Tommy Alcozar, by unanimous decision, 30-27 on all 3 judges cards. Jeffery Bybee Jr. Peoria, Illinois, USA, 3-1/1, 85, 4'10", 13, 1-9-90, Ryan Blackorby, lost his opening bout to Renteria by split decision, 29-28, 30-27, 28-27. Tyler Smith, Beloit, Wisconsin, USA, 0-1/0, 81, 5'1", 12, 6-27-91, Craig Monyelle, lost his opening round bout to eventual champion Holcomb by TKO at 1:13 of round 3. FULL CONTACT RULES: Junior Cruiserweight 90.1-95 lbs. 9 - 10 - 11 Year Olds. Phreddy Capers, Virginia Beach, Virginia, USA, 6-4/0, 91, 4'5", 11, 11-8-91, Craig Smith, by unanimous decision, 30-27 on all 3 judges cards. Jaden Veach, Dubuque, Iowa, USA, 1-1/0, 95, 4'4, 9, 11-15-93, Dean Lessei, was the number 1 seed so he had a first round bye. He lost his first bout in round 2 to eventual champion Rendon by TKO at 1:10 of round 1. Timmy Ball II, Pennsville, New Jersey, USA, 1-3/0, 93, 4'11", 11, 9-20-91, Tim Ball, lost his opening bout to Eventual champion Redon by unanimous decision, 30-27, 30-27, 29-28. Konrad Kubicki, Chicago, Illinois, USA, 0-1/0, 95, 4'4", 10, 4-27-93, Jim Klauba, lost his opening bout to Capers by split decision, 30-27, 30-27, 28-29. Andre Camarena, Norcross, Georgia, USA, 2-2/1, 105, 5'5", 13, 7-20-90, George Allen, by unanimous decision 30-25, 30-25, 30-26. Chad Monyelle, Beloit, Wisconsin, USA, 7-2/4, 102, 5'3", 13, 11-8-89, Craig Monyelle, lost his opening round bout to eventual champion Lawerence in what was expected to be a close match between two winning record fighters. However Lawerence stopped him quick by TKO at only 33 seconds into round 1. Jade Studelska, Dubuque, Iowa, USA, 0-2/0, 105, 5', 11, 4-27-92, Dean Lessei, lost his opening round bout to Camarena by unanimous decision 30-24 on all 3 judges cards. INTERNATIONAL RULES: Super Atomweight 110.1-115 lbs. 14-15 Year Old. Zein Al-Ziyadi, Detroit, Michigan, USA, 0-1/0, 113, 5'4", 15, 2-13-88, Elliot Cooper, by unanimous decision 30-27 on all 3 judges cards. Nic Houser, Twin Falls, Idaho, USA, 3-3-2/0, 115, 5'6", 14, 5-15-89, Brian Higgins, lost his opening bout to eventual champion Sierra by unanimous decision 30-27 on all 3 judges cards. INTERNATIONAL RULES: Bantamweight 120.1 lbs. - 125 lbs. 14, 15,16 Year Olds. Kole Campbell, (2002 Atomweight Champion) Twin Falls, Idaho, USA, 2-1/0, 124 5'7", *14, 11-9-88, Brian Higgins, by unanimous decision, 29-27, 30-26, 30-26. Carson Marlow, Monterey, California, USA, 0-1/0, 125, 5'7", 16, 6-2-87, Bodywox Gym, by TKO at 1:20 of round 2. Jonathan Oudthone, Jacksonville, Arkansas, USA, 1-4/1, 125, 5'8", 16, 5-16-87, Prathet - Muay thai, lost his opening round bout to eventual champion Haq by unanimous decision 29-27, 30-26, 30-27. (**) Entered the tournament with an 0-0 record. (*) Trainer OK'ed this since Kole will turn 15 in November and Bruce turned 16 in Feb. - Jonathan just turned 16 in June. Bruce Niimoto, Aiea, Hawaii, USA, 1-0/0, 121, 5'1", 16, 2-16-87, Tony Giraldi, was a no show at the event. FULL CONTACT RULES: Lightweight 130.1-135 lbs. 14 & 15 Year Olds. William Phillips, Greer, South Carolina, USA, 1-1/0, 131, 5'9", 15, 6-21-88, Kevin Hudson, by unanimous decision, 29-27 on all 3 judges cards. William Lucero, Plainview, Texas, USA, 2-4/1, 131, 5'5", 14, 8-2-89, Tommy Alcozar, by split decision 29-28, 29-28, 28-29. Christopher Royer, Richardson, Texas, USA, 0-2/0, 135, 5'3", 14, 5-26-89, Steve Goin, lost his opening bout to Phillips by unanimous decision 29-28, 29-28, 30-27. FULL CONTACT RULES: Lightweight 130.1-135 lbs. 16 & 17 Year Olds. Koda Sanborn, Waterloo, Iowa, USA, 4-2/0, 12, 131, 5'4"", 17, 11-26-86, Russ O'Connell, by TKO at 1:29 of round 1. Jason Adams, Eau Clair, Wisconsin, USA, 4-4/1, 131, 5'7", 17, 9-27-85, Shawn McCarthy, lost his opening round bout to eventual champion Felts by unanimous decision 30-21 on all 3 judges cards. London Curtis, Clarksdale, Mississippi, USA, 7-1/2, 135, 5'8", 16, 12-8-86, Leroy Curtis, lost his opening bout to Sanborn by split decision 29-28, 30-27, 27-29. Mike Spelz, Chicago, Illinois, USA, 3-3/0, 151, 5'11", 16, 12-15-86, Jim Klauba, by split decision 29-28, 29-28, 28-29. Jesus Martinez, Plainview, Texas, USA, 15-3/8, 150, 6', *15, 1-8-88, Tommy Alcozar, lost his opening round bout to eventual champion Anderson 30-27, 30-27, 29-28. FULL CONTACT RULES: Light Middleweight, 153.1 lbs. - 159 lbs. 16-17 Year Olds. Jason Barrett, Moultrie, Georgia, USA, 3-1/1, 159, 6'1", 16, 5-29-87, James Corbett, by TKO at 56 seconds into round 2. Josh Fischer, St Louis, Missouri, USA, 0-1/0, 159, 5'10", 17, 8-31-85, Finney's Kickboxing, lost his opening bout to eventual champion Turner by unanimous decision 30-26, 30-25, 30-25. Billy Heslop, Douglasville, Georgia, USA, 2-3/1, 156, 59", 15, 7-12-88, Mike Wood, lost his opening round bout to Barrett by split decision, 29-28, 29-28, 28-29. Elizabeth Ortega, Elgin, Illinois, USA, 2-1/0, 115, 5'3", 18, 10-23-84, Rob Zbilski, by unanimous decision, 30-27 on all 3 judges cards. Kate Lessard, Eau Clair, Wisconsin, USA, 2-3/0, 115, 5'4", 19, 3-14-84, Duek Kaio, lost her opening bout to eventual champion McNamara by unanimous decision, 30-27, 30-27 and 30-28. Corie Smith, Camp Verde, Arizona, 1-1, 115, 27, Richard Williams, lost her opening bout to Ortega by unanimous decision 29-28 on all 3 judges cards. FULL CONTACT RULES: Flyweight 117.1 lbs., - 120 lbs. Suzanne Anderson, Minneapolis, Minnesota, USA, 12-4-/, 119, 5'1", 34, 11-29-68, C. B. Bunkholt, by unanimous decision 30-27, 30-27, 29-28. MUAY THAI RULES: Bantamweight 120.1 lbs. - 124 lbs. CHAMPION: Katie Meehan, Denver, Colorado, USA, 9-2-1/1, 121, 5'5", 28, 12-31-74, Aaron Williams & Clarance Thatch, was the only walkover winner of the 2003 Nationals when her opponents Alison Moore, (2002 IR Champion) New York, New York, USA, 1-3/1, 124, 5'5", 26, 3-14-76, Steve Ventura, and Alona Kipp, Casper, Wyoming, USA, 0-0/0, 121, 5'1", 17, 9-25-85, Jarred Nab, were both no shows at the event. Although not confirmed, it is possible Williams did not show because of the massive power outage in the north/east USA and parts of Canada that shut down many airports (Including New York) on Thursday before the event. FULL CONTACT RULES: Featherweight 124.1 - 128 Lbs. Stephanie Kernan, Eau Claire, Wisconsin, USA, 5-3/0, 126, 5'6", 27, 2-26-76, Michael Lind, by unanimous decision 29-28, 30-27, 30-27. Felice Herrig, Buffalo Grove, Illinois, USA, 0-1/0, 126, 5'5", 18, 9-18-84, Jim Zbilski, lost her opening bout to Kernan by unanimous decision 29-28, 30-27, 30-27. FULL CONTACT RULES: Super Lightweight 132.1 lbs. - 137 lbs. Andrea Zalas, Simpsonville, South Carolina, USA, 6-3/1, 137, 5'8", 18, 10-17-84, Ray Thompson, by unanimous decision, 30-27, 30-27, 29-28. This bout was a rematch of their South East regional bout which Woods won by split decision 29-28, 27-30 and 29-28. Jenn Repa, St Louis, Missouri, USA, 15-3/6, 137, 5'8", 22, 9-14-80, Finney's Kickboxing, could not make the weight for this division. MUAY THAI RULES: Super Lightweight 132.1 lbs. - 137 lbs. Avigail Yahudah, Athens, Georgia, USA, 0-3/0, 133, 5'3", 20, 5-26-83, Scott Hicks, by unanimous decision 29-28, 29-28, 30-27. Jennifer Cutler, Alexandria, Virginia, USA, 0-1/0, 133, 5'4", 24, 10-18-78, Mike Hess, lost her opening bout to eventual champion Bem by unanimous decision 29-28, 30-27, 30-27.
INTERNATIONAL RULES: Light Welterweight 137.1 lbs. - 142 lbs. Jill Schmidt, Avon, Indiana, USA, 1-1/0, 146, 5'8", 22, 9-29-80, Ray Barkine, by unanimous decision 29-28 on all 3 judges cards. Ashley Sanchez, Galesburg, Illinois, USA, 0-1/0, 140, 5'7", 18, 7-17-85, Self Trained, lost her opening bout to Schmidt by unanimous decision 30-24, 30-23, 30-23. Katie Heller, Omaha, Nebraska, USA, 0-1/0, 140, 5'6", 24, 2-17-78, Mick Doyle, lost her opening bout to eventual champion Wilson by unanimous decision, 30-27 on all 3 cards. (**) Entered event with an 0-0 record. FULL CONTACT RULES: Super Welterweight 147.1 lbs - 153 lbs. Chrisanne Roseleip, (2002 Defending Super Welterweight Champion) Denver, Colorado, USA, 6-3/0, 152, 5'7", 27, 7-25-75, Clarence Thatch by split decision 29-28, 29-28, 28-29. Alindrina Allen, Norcross, Georgia, USA, 0-1/0, 153, 5'7", 39, 12-12-63, Gary Brown,lost her opening bout to eventual champion Hicks by TKO at 1:30 of round 1. Jennifer Thyssen, Eau Clair, Wisconsin, USA, 19-3-1/4, 150, 5'5", 30, 4-19-73, Duek Kaio, was unable to make the weight in this division. FULL CONTACT RULES: WOMAN'S TOURNAMENT - Middleweight 162 lbs. - 172 lbs. Bobbie Brown, Lawrenceville, Georgia, USA, 1-6/0, 163, 5'8", 40, 10-20-62, Gary Brown, who was the number 3 seed by TKO at 1:56 of round 2. Julie Keppler, Crystal Lake, Illinois, USA, 3-3/2, 168, 5'11", 38, 5-10-65, Rob Zbilski, lost her opening bout to eventual champion Droluk by unanimous decision 30-27 on all 3 judges cards. Amy Beck, Beloit, Wisconsin, USA, 0-1/0, 172, 5'7", 27, 3-16-76, Craig Monyelle, lost her opening bout to eventual champion Droluk by unanimous decision 30-26, 30-26, 30-26. Deibra Brown, Belleville, Michigan, USA, 0-1/0, 162, 5'5", 26, 10-29-76, Elliot Cooper, lost her opening bout to Bobbie Brown by unanumous decision 28-26, 28-27 and 28-27. Dallas Crowe, Spartanburg, South Carolina, USA, 5-4/2, 127, 5'7", 18, 9-8-84, Kevin Hudson, by split decision 29-28, 29-28, 28-29. Juan Vargas, Beloit, Wisconsin, USA, 0-1/0, 125, 5'3", 34, 9-26-68, Craig Monyelle, lost his opening bout to eventual champion Lebron by unanimous decision 30-27, 30-27 and 29-28.
INTERNATIONAL RULES: Lightweight 128.1 lbs. to 132 lbs. David Oudthone, Jacksonville, Arkansas, USA, 2-5/0, 129, 5'8", 33, 3-2-70, Prathet - Muay Thai by TKO at 1:19 of round 2. Joseph Balkis, Robbins, Illinois, USA, 9-10/4, 132, 5'5", 33, 6-28-69, Glenn Hudson, lost his opening bout to eventual champion Dexter by unanimous decision 29-26 on all 3 judges cards. Andy Garcia, Casper, Wyoming, USA, 0-0/0, 130, 5'9", 20, 4-8-83, David Smith, was a no show at the event. FULL CONTACT RULES: Super Lightweight 132.1 lbs. to 137 lbs. Robert Elledge, Roseville, CA, 13-1/3, 136, 5'10", 18, 7-28-84, Dave Marinoble, by split decision 29-28, 29-28, 28-29. Javiar Buentello, Plainview, Texas, USA, 18-8/10, 142, 5'5", 34, Tommy Alcozar, lost his opening bout to Elledge by split decision 29-28, 29-28, 28-29. Andre' Pittman, Clarksdale, Mississippi, USA, 9-1/0, 135, 5'7", 21, 4-6-81, Leroy Curtis, lost his opening bout to eventual champion George by TKO at 1:29 of round 2.
INTERNATIONAL RULES: Super Lightweight 132.1 lbs. to 137 lbs. Hassan Makky, Dearborn, Michigan, USA, 2-1/0, 135, 5'10", 20, 2-28-83, Elliot Cooper, by TKO at :34 seconds into round 3. Greg Ardon, Brooklyn, New York, USA, 4-4-1/2, 137, 5'9", 29, 11-24-73, Phil Nurse were no shows at the event. Although not confirmed, it is possible Ardon did not show because of the massive power outage in the north/east USA and parts of Canada that shut down many airports (Including New York) on Thursday before the event. FULL CONTACT RULES: Light Welterweight 137.1 lbs. to 142 lbs. Derrick Jones, Clarksdale, Mississippi, USA, 8-1/0, 140, 5'6", 21, 5-8-81, Leroy Curtis, by unanimous decision 30-27 on all 3 judges cards. INTERNATIONAL RULES: Light Welterweight 137.1 lbs. to 142 lbs. Virgil Begay, Albq., New Mexico, USA, 4-4/1, 141, 5'8", 30, 11-30-72, Mike Winkeljohn, by unanimous decision 30-27, 30-27, 29-28. Mike Feeback, Casper, Wyoming, USA, 0-1/0, 140, 5'7", 27, 11-30-76, Jerned Nab, lost his opening bout to eventual champion Perelmutter by TKO at :35 seconds into round 3. Ryan Granger, Colorado Springs, Colorado, USA, 0-1/0, 138, 5'11", 19, 4-17-84, Eric Lalone, lost his opening bout to Begay by unanimous decision 29-28, 30-27, 30-27. Marcelo Bezon, Wavonda, Illinois, USA, 5-0/0, 147, 5'8", 30, 5-14-72, Shishan Gangi, by majority decision 28-28, 29-27, 29-27. Rey Duran, Beloit, Wisconsin, USA, 3-3/3, 145, 5'6", 35, 1-1-68, Craig Monyelle, had a bye in round 1 but lost his opening bout in round 2 to eventual champion Greubel by TKO at 1:55 of round 1. Chad Buchholz, Fall Creek, Wisconsin, USA, 1-2-0/1, 147, 5'9, 28, 4-15-75, Michael Lind, by unanimous decision 30-26, 30-26, 29-26. Gregory Vavoso III, Ft Lauderdale, Florida, USA, 0-0/0, 146, 5'8", 26, 4-9-77, Mike Hess, lost his opening bout to eventual champion Greubel by TKO at 1:58 of round 1. FULL CONTACT RULES: Super Welterweight 147.1 lbs. to 153 lbs. Shelton Barnes, Mundelein, Illinois, USA, 8-3/2, 153, 6'1", 33, 10-9-69, Jim Zbilski, by unanimous decision 29-26, 29-26, 28-27.
INTERNATIONAL RULES: Super Welterweight 147.1 lbs. to 153 lbs. Dylan Leonard, St Louis, Missouri, 7-3/0, 153, 5'9", 21, 3-1-82, Finney's Kickboxing, by unanimous decision 30-27, 29-28, 29-28. Brandon Templeton, Detroit, Michigan, USA, 0-1/0, 153, 5'7", 20, 7-7-82, Elliot Cooper, was seeded number 1 and received a first round bye. However he was defeated by eventual champion Larson in his first bout in round 2 by unanimous decision, 30-27 on all 3 judges cards. Eric Kucovic, Albq., New Mexico, USA, 5-3/2, 154, 6'1", 26, 10-24-76, Mike Winkeljohn, lost his opening bout to Leonard by TKO at 1:49 of round 2. Chris Archuleta, Casper, Wyoming, USA, 1-5/0, 152, 5'6", 26, 10-27-76, David Smith, lost his opening round bout to eventual champion Clifford Larson by unanimous decision 30-27 on all 3 judges cards. Michael Reno, New York, NY, USA, 7-5-1/2, 150, 5'8", 27, 8-22-75, Phil Nurse, was a no show at the event. Although not confirmed, it is possible Reno did not show because of the massive power outage in the north/east USA and parts of Canada that shut down many airports (Including New York) on Thursday before the event. MUAY THAI RULES: Super Welterweight 147.1 lbs. to 153 lbs. Liajdub Vang, Des Moines, Iowa, USA, 0-0/0, 150, 5'5", 25, 6-20-78, Self, by TKO at 1:25 of round 3. Joe Sampieri, New York, NY, USA, 13-2-3/7, 153, 5'8", 28, 6-12-75, Phil Nurse were no shows at the event. Although not confirmed, it is possible Sampieri did not show because of the massive power outage in the north/east USA and parts of Canada that shut down many airports (Including New York) on Thursday before the event. Shannon Hudson, Greer, South Carolina, USA, 18-8/8, 158, 5'8", 23, 10-11-79, Kevin Hudson, by unanimous decision, 30-27, 29-28, 30-27 in a bout that was closer than the scores sound to win his 4th IKF National Tournament title. Jeremy Mather, Cedar Rapids, Iowa, USA, 2-2/2, 159, 28, 8-4-74, Jerome Owens, lost his opening bout to eventual champion McGaughey by TKO at 1:34 of round 2. Clint Martin, Augusta, Georgia, USA, 1-2/1, 159, 6'2", 21, 7-14-81, Mark Grubel, lost his opening round bout by split decision 30-27, 29-28, 28-29. Michael McMullen, Newcastle, Pennsylvania, USA, 5-1/3, 154, 5'10", 30, 3-14-73, Mark Norge, was a no shows at the event. Although not confirmed, it is possible McMullen did not show because of the massive power outage in the north/east USA and parts of Canada that shut down many airports (Including New York) on Thursday before the event. Josh Wilson, Twin Falls, Idaho, USA, 1-1/0, 154, 5'11", 25, 4-3-78, Self, by unanimous decision 29-28 on all 3 judges cards. Joe Wood, Casper, Wyoming, USA, 0-1/0, 155, 6'1", 45, 1-7-57, David Smith, lost his opening round bout to eventual champion Rhodes by TKO at 1:31 od round 3. Jonathan Hoppes, Waterloo, Iowa, USA, 2-2/1, 159, 5'7", 23, 1-14-80, Russ O'Connell,lost his opening round bout to Wilson by TKO at 21 seconds into round 1. Tommie Reidemar, Barrington, Illinois, USA, 1-0/1, 159, 6', 31, 1-24-72, Jim Zbilski, was a no show at the event. David Flurry, Dubuque, Iowa, USA, 7-4/1, 153, 5'7", 16, 1-6-87, Dean Lessei, (563) 588-1012 by TKO at 1:40 of round 2. Brian Robertson, Athens, Georgiam, USA, 1-1/1, 158, 5'9", 24, 10-14-78, Scott Hicks, by unanimous decision 29-28, 30-27, 29-28. James Shin, Indianapolis, Indiana, USA, 0-1/0, 155, 5'5", 21, 8-30-81, Ray Sarkine, lost his opening bout to Flurry 30-27, 29-28, 29-28. FULL CONTACT RULES: Middleweight 159.1 lbs to 165 lbs. Nathan Bagby, Plano, Texas, USA, 5-3-1/1, 162, 5'11", 20, 11-18-62, Geoff Laun, by unanimous decision 30-27 on all 3 judges cards. Josh Mather, Cedar Rapids, Iowa, USA, 2-4/0, 165, 5'9", 24, 12-30-78, Jerome Owens, by majority decision 29-29, 30-27, 29-28. Eustorgio Gama, Elgin, Illinois, USA, 13-6-1/1, 165, 6', 25, 12-30-77, Jim Zbilski, was seeded number 1 and had a first round bye but lost his opening bout in round 2 to eventual champion Buchholz by split decision 29-28, 29-28, 28-29. Antonio Cage, Clarksdale, Mississippi, USA, 1-1/0, 165, 5'9", Leroy Curtis, lost his opening bout to Bagby 30-26 on all 3 judges cards. Ryan Andrews, Casper, Wyoming, USA, 0-1/0, 165, 5'10", 21, 4-21-82, Jerned Nab lost his opening bout to eventual champion Buchholz by TKO at 29 seconds of round 1. MUAY THAI RULES: Middleweight 159.1 lbs to 165 lbs. Steve Rapinski, Wyandotte, Michigan, USA, 2-2/0, 163, 5'7", 27, 1-30-76, Elliot Cooper, by split decision 30-27, 30-27, 28-29. Mike Bengochea, Athens, Georgia, USA, 3-3/1, 165, 5'10", 20, 9-1-82, Scott Hicks, lost his opening bout to eventual champion Corley 30-27 on all 3 judges cards. Bruce Erickson, Kingsford, Michigan, USA, 1-5/0, 168, 5'9", 47, 2-25-56, Kak Koonnala, was a no show at the event. INTERNATIONAL RULES: Super Middleweight 165.1 lbs to 172 lbs. Roberto Carrillo, Camp Verde, Arizona, 13-3, 166, 30, Richard Williams, by split decision 29-28, 29-28, 27-30. Michael Johnson, Omaha, Nebraska, USA, 0-4/0, 168, 5'11", 28, 7-15-74, Mick Doyle, had attained the number one seed in the division by registering at his regional event, but he didn't go to the regional to fight. Although he received a first round bye because of his seeding, the seed didn't help him as he lost his opening bout in the second round to eventual champion Burnsed by unanimous decision 30-27, 30-27, 29-28. Joe Lilly, Silver Springs, Virginia, USA, 0-1/0, 172, 5'11", 22, 10-20-80, Mike Hess, by unanimous decision 30-25, 29-27, 30-25. James Nemeth, Casper, Wyoming, USA, 0-1/0, 170, 5'7", 44, 8-18-58, David Smith lost his opening bout to eventual champion Burnsed by KO at 1:55 of round 3 by a head kick KO. FULL CONTACT RULES: Light Heavyweight 172.1 lbs to 179 lbs. Sean Crowe, Waterloo, Iowa, USA, 5-5/3, 179, 6'1", 30, 6-20-73, Russ O'Connell, by TKO at the end of round 2. Matthew Dole, Casper, Wyoming, USA, 0-1/0, 173, 5'10", 27, 5-21-76, Jared Nab, in the opening bout of the division, 30-24, 30-23, 30-23. Mike Green, St Louis, Missouri, 3-1/0, 179, 6'2", 29, 8-1-73, Finney's Kickboxing, lost his opening bout to Crowe by unanimous decision, 29-27 on all 3 judges cards. INTERNATIONAL RULES: Light Heavyweight 172.1 lbs to 179 lbs. Jason Moore, Trenton, Michigan, USA, 2-1/0, 175, 6'2", 23, 4-12-80, Elliot Cooper, by split decision 29-28, 29-28, 28-29. Glenn Haley, San Jose, California, USA, 5-1-1/4, 174, 6', 31, 12-31-71, Gil Acosta, by unanimous decision 29-27, 29-27, 29-26. Charles Crenshaw, Vienna, Virginia, USA, 1-2/0, 178, 5'10", 23, 6-24-80, Mike Hess, lost his first round bout to Moore by unanimous decision 29-28, 29-28, 30-27. Rob Graff, Colorado Springs, Colorado, USA, 0-1/0, 172, 5'11", 29, 7-5-73, Eric Lalone, lost his opening bout to eventual champion Stumpf in a 4th round tie breaking round. Bill Jardine, Mondovi, Wisconsin, USA, 11-3/1, 184, 6'3", 25 9-22-77, Michael Lind, by unanimous decision 29-28, 29-28, 30-27. Jeremy Hodges, Beloit, Wisconsin, USA, 2-2/2, 184, 6'4", 29, 10-20-73, Craig Monyelle, was defeated by eventual champion Engle by unanimous decision 29-28, 30-26, 29-27. Rob Matthews, (2002 Defending Light Cruiserweight Champion) Denver, Colorado, USA, 2-1-1/0, 186, 6'1", 31, 8-11-71, Clarence Thatch, by split decision 29-28, 29-28, 28-29. Joel Donnelly, Davenport, Iowa, USA, 3-1/1, 185, 6'2", 18, 4-24-85, Pat Miletich, by unanimous decision 29-28, 29-28, 30-27. Kyle Groenewold, Delavan, Illinois, USA, 1-2/0, 186, 6'1", 25, 12-8-77, Ryan Blackorby, was seeded number one in the division and received a first round bye. However, he lost his opening bout in round 2 to Donnelly, 29-28, 29-28, 30-27. William Whitlow, Memphis, Tennessee, USA, 4-1/2, 185, 5'11", 28, 11-19-74, Jeff Mullen, lost his opening bout to eventual champion Hoffman by split decision 29-27, 29-26, 28-29. Bud Lawson, Gillette, Wyoming, USA, 0-2/0, 195, 6', 25, 10-1-77, Jerned Nab, lost his opening bout to Donnelly by TKO at 1:40 of round 1. Charles Pemble, (2002 Defending Champion) Marquette, Michigan, USA, 9-5/1, 185, 5'10", 47, 3-8-56, Kak Koonnala, showed up at weigh-ins but withdrew due to an injury. MUAY THAI RULES: Cruiserweight 186.1 lbs to 195 lbs. Yahosuah Yahudah, Athens Georgia, USA, 4-4/1, 194, 5'9", 21, 3-3-82, Scott Hicks, by unanimous decision 30-27, 30-27, 29-28. Jarred Nab, Casper, Wyoming, USA, 0-2/0, 185, 5'9", 25, 2-22-79, Jared Nab, lost his opening bout to eventual champion Pemble by TKO at 1:00 of round 1. Tom Hopper, Olin, Iowa, USA, 0-2, 195, 5'11", 38, 8-2-64, Dean Lessei, lost his opening bout to Yahudah by unanimous decision 29-28, 29-28, 30-27. FULL CONTACT RULES: Heavyweight 195.1 lbs. to 215 lbs. Mark Adams, Douglasville, Georgia, USA, 3-2-1/0, 208, 6'1", 30, 2-2-73, Mike Wood, by unanimous decision 30-26 on all 3 judges cards. Tim Nouosel, Pittsbourgh, Pennsylvania, USA, 2-1/1, 205, 6', 30, Jimmy Stewart, lost his opening bout to eventual champion Bozada by TKO at 1:31 of round 2.
INTERNATIONAL RULES: Heavyweight 195.1 lbs. to 215 lbs. Dusty Miller, Norman, Oklahoma, USA, 5-1-1/2, 210, 6', 23, 12-1-79, Scott Mincey, by unanimous decision 30-27, 29-28, 29-28. MUAY THAI RULES: Heavyweight 195.1 lbs. to 215 lbs. Chuck Baxter, Dubuque, Iowa, USA, 1-2/0, 215, 5'11", 30, 8-30-72, Dean Lessei, in what turned out to be a rematch of their regional bout. At the regional Castle defeated Baxter by TKO at 1:22 of Round 3. He repeted history in the win in almost the same way with a win by TKO at 1:50 of round 3. FULL CONTACT RULES: Super Heavyweight 215.1 lbs. and up. Eric Lalone, Colorado Springs, Colorado, USA, 17-4/14, 240, 6'1", 28, 10-30-74, John Moncayo, by split decision 29-28, 29-28, 28-29. Tim Ball, Pennsville, New Jersey, USA, 5-5/0, 285, 6', 36, 6-17-67, Tim Ball, lost his opening bout to eventual champion Matrasko by TKO at 1:30 of round 2. Joseph Furdge, Clarksdale, Mississippi, USA, 0-4/0, 218, 5'11", 26, Leroy Curtis, lost his opening bout to Lalone by TKO at 55 seconds of round 3. So... Where did the 2003 IKF/TKO USA National Title Belts Go?